Unless you’ve been avoiding the news for the past twenty-four hours, you’ve heard the name Wendy Davis mentioned. 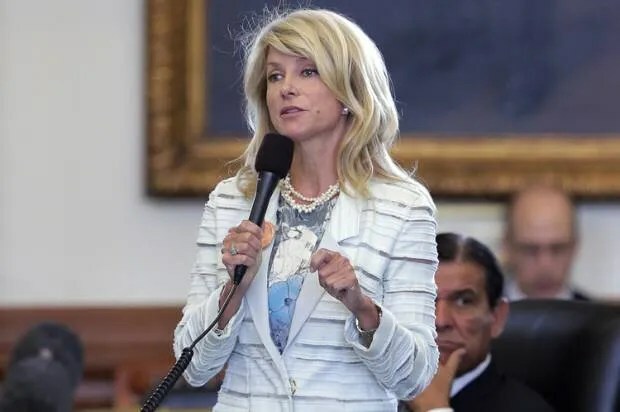 On Tuesday, Davis stood up to the senate in an effort to filibuster a Texas bill on abortion that would provide even more limitations on a woman’s right to control her own body. The bill would add further restrictions on abortion clinics around the state, including banning any abortion after the twenty-week marker and require all but five abortion clinics in Texas to be closed. The women who so badly need access to abortion to clinics would no longer be able to get to them. Ms. Davis was nineteen when she had her first child, but managed to get herself from a trailer park all the way through Harvard Law School and eventually to the Texas Senate. “She’s carrying every woman in the state of Texas, if you will, on her shoulder,” said Cecile Richards, president of Planned Parenthood. If Davis’ filibuster successfully continued till midnight, the legislature would be unable to take a final vote and thus successfully block the bill. The rules regarding filibusters in the state degree that Davis had to remain on topic the entire time, was unable to lean on any additional support (including a desk or a chair), and could not pause for a bathroom break, food or water. After three strikes the filibuster could be called off. Davis’ first strike came when she discussed Planned Parenthood’s budget, which according to the legislature did not pertain to the bill being discussed. The second when after standing for almost seven hours, Davis had a colleague help her adjust a back brace. Davis received her final strike when she discussed the current laws requiring a woman to have a sonogram before a doctor will perform an abortion. When the Senate called an end to the Davis’ filibuster, state Senator Leticia Van De Putte spoke up saying “at what point must a female senator raise her hand or her voice to be recognized over her male colleagues?” resulting in shouts of support throughout the chamber. Despite the senate’s attempt to silence Davis, her efforts resulted in the bills final votes being taken at 12:03, three minutes too late for SB 5 to be passed as a law. Throughout this ordeal Wendy Davis got countless supporters. Tweets vary from actor Mark Ruffalo to president Barack Obama showing their support of Davis with hashtags such as #StandWithWendy. Her salmon colored sneakers that she apparently threw on as she ran out the door have become a symbol of her stand. But why is it that a woman’s right to control her body is still being discussed? When was the last time a man had to stand for eleven hours so that he could have control of his own body? And then to add to this, the protestors supporting a woman’s right to control her own body were called terrorists by Texas Republican legislator Bill Zedler. Since when did fighting for what should be your right make you a terrorist? People are furious and for good reason – it’s 2013 and women are still forced to fight for their right to choose. The fight isn’t over, but at least people are listening. See other articles on Wendy Davis and the Texas filibuster at The New York Times, The Washington Post, and National Public Radio. In a news conference Deanna Favre announced she will be the starting QB for the Packers this coming Sunday. She claimed she is qualified to be starting QB because she has spent the past 16 years married to Brett while he played QB for the Packers. Because of this she understands how to pick up a corner blitz and knows the terminology of the Packers offense. A poll of Packers fans shows that 50% of those polled supported the move. Does this sound idiotic and unbelievable to you? Yet Hillary Clinton makes the same claims as to why she is qualified to be President and 50% of democrats polled agreed. What is required when in the role of First Lady of the White House is quite different from that which is required when in the role of First Lady of the NFL. This is a silly parallel to draw. I would be interested to know if whoever authored this tid-bit is at all informed about Hillary’s activities during her husband’s presidency. Let us also not forget that she was elected and re-elected to the United States Senate all on her own. On my count, that’s first-hand experience in two of the three branches of the federal government, which is more than any of the other current candidates can lay claim to. Make whatever character judgments you’d like about Senator Clinton; however, questioning her qualifications by likening her (and, for that matter, reducing her) to someone’s wife and the wife of an NFL athlete at that, does not bode well for assumptions that will be made regarding one’s own intelligence. Thanks to Shanna for sharing this sexist email litter and her riposte.